The Concordia Stingers football team are in the midst of off-season training to prepare for the 2017 season. The schedule for the upcoming season was recently released and, after looking it over and giving it some thought, it’s certain this fall will be a tough test for the squad, that sees most of it’s key players returning. One of the reasons why the upcoming season will be tougher than past years is the absence of the Bishop’s Gaiters. The Stingers, who play in the Réseau du sport étudiant du Québec (RSEQ) division, have always played Bishop’s twice. However, due to poor performances and the financial inability to have the same resources as other teams in the division, the Gaiters left the RSEQ for the Atlantic University Sport (AUS) conference, according to U SPORTS. Bishop’s was a team the Stingers could always win against. In 2015, the Stingers beat Bishop’s twice, 38-18 the first time around and 63-0 the second time. 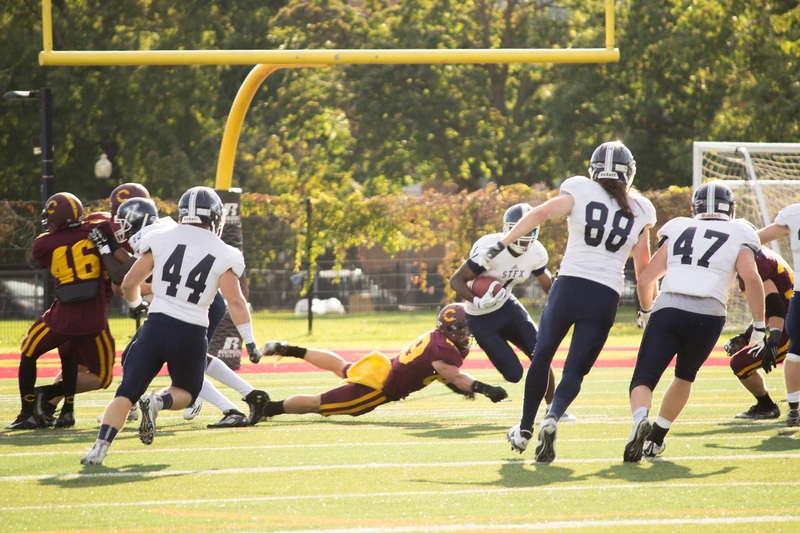 This past season, the Stingers won their two games against Bishop’s 50-34 and 36-6. Now that Bishop’s is gone, there are only five teams in the division. A season is eight games which means the Stingers must now play every team twice. This is where the schedule becomes tougher. The Stingers share a division with arguably the two best teams in U SPORTS football: the Université de Montréal Carabins and the Laval Rouge et Or. The Rouge et Or are defending Vanier Cup champs while the Carabins won it in 2014. Last season, the Stingers had a hard time against both teams, as the Carabins beat them 59-3 and the Rouge et Or beat them 38-17. Now that the Stingers have to play both of those squads twice, it means half of their schedule will be against top-seeded opponents. The Stingers have played those teams close in past seasons, so there is definitely potential to get some upset victories—especially if quarterback Trenton Miller returns to his rookie season form of 20 touchdowns in eight games. A five-team division means only one team will not make the playoffs—that’s why the games against the Sherbrooke Vert et Or and the McGill Redmen become crucial. The Stingers, the Redmen and the Vert et Or will most likely be fighting for the last two spots in the playoffs. The Stingers play the Vert et Or in the second game of the season on Aug. 31 in Sherbrooke and then play them again on Sept. 30 at Concordia. Sherbrooke is a team the Stingers have struggled with over the past two years. In their 2015 debut, the team lost 37-0 to the Vert et Or and lost to them last season 37-17. If the Stingers want a playoff berth, they’ll have to overcome their struggles against Sherbrooke and bring their best effort. Meanwhile, the Redmen are the Stingers’ cross-town rival. Both of these teams always play each other close, but the Stingers have been on the winning end of most of their recent match-ups. Going back to 2015, the Stingers won both of their games against McGill and went 1-1 last season. These rivalry games, which take place at Concordia on Sept. 16 and at McGill on Oct. 14 next season, will have huge implications on the playoffs and winning them will be crucial for the Stingers. The team has gone 4-4 in its last two seasons, but in each of those years, two of the wins were against Bishop’s. The upcoming season will truly be a test of what the Stingers are made of. However, it’s the same test for the Vert et Or and the Redmen. The division was already tough, but now it’s gotten tougher and that’s why it will be an interesting season to say the least.